Electromagnetic Hypersensitivity, EHS, is a disabling condition caused by wireless technology radiation and is being suffered alreafy by at least 10% of the population including children. The correlation of the condition to radiation has been established already 60 years ago, nevertheless it has been denied and the human rights of people and children with EHS are being crushed and they are becoming refugees and for some, surviving in this wireless world is increasingly impossible. 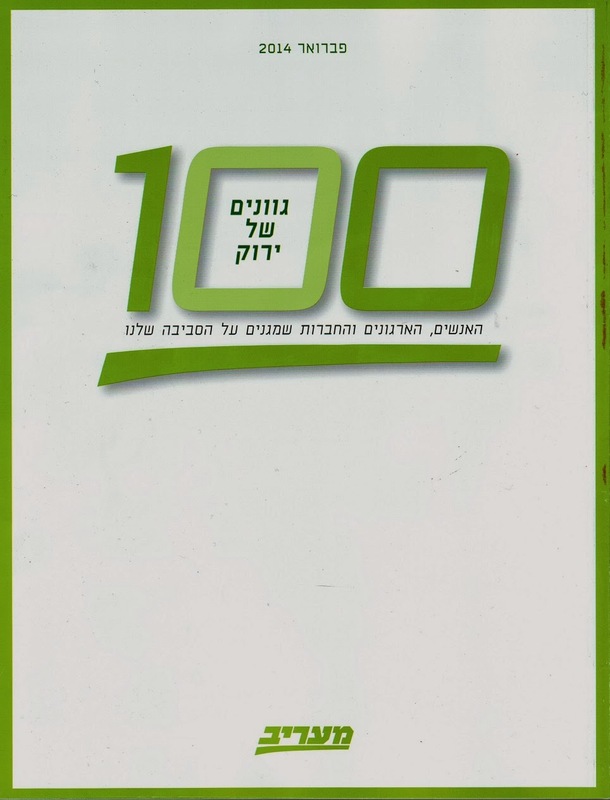 The Israeli case to ban Wi-Fi in schools was chosen By Ma’Ariv Newspaper As one of ‘The 10 Most Important Environmental Battles We Should Follow This Year'. 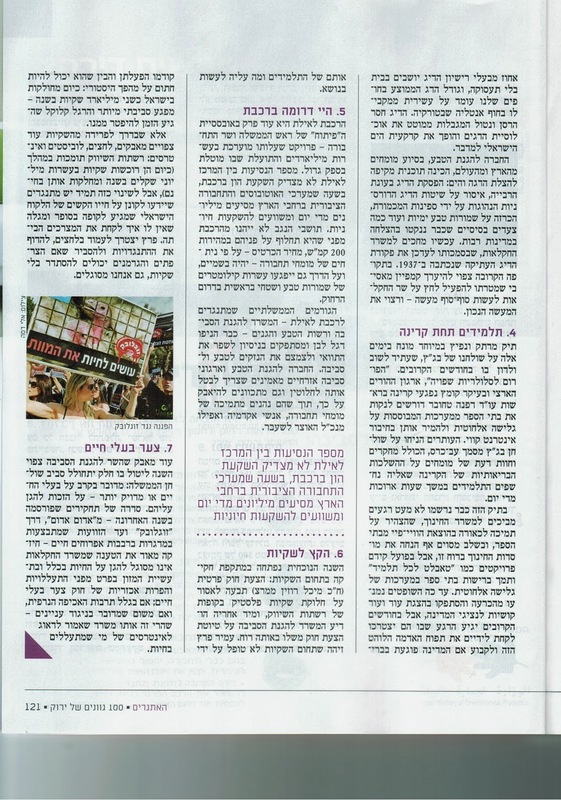 In a special Magazine dedicated to Environmental issues which was published in this weekend issue, Ma’Ariv newspaper published the article which was written by the journalist Aviv Lavi, the leading environmental journalist in Israel and who has been following the issue closely. Mr. Lavi titled it “Students Under Radiation”. The case was number 4 on the list and while Mr. Lavi wrote me that the list is not by order of importance, I of course think it should have been number 1 and at the same time 2 & 3 as well..:-) ha ha. A fascinating and especially explosive case is currently in the hands of the Israeli Supreme Court, which is due to conduct yet another hearing in the case in the coming months. ‘The Forum for Sane Cellular Use’, ‘The Israeli Parents Leadership’ and mainly, a small group of people who have been harmed by the radiation, led by attorney Dafna Tachover, demand to remove wireless based systems from schools and replace them with wired networks. The Claimants laid down at the Supreme Court desk a very-thick brief including research papers and experts opinions regarding the health impacts of the radiation to which the children are exposed many hours on a daily basis. This case already created many embarrassing moments to the Ministry of Education which declared alleged support of removing Wi-Fi from schools and at a certain point, accordingly, even issued such a decree to the schools, but in effect, it has been pushing programs like ‘Tablet to every student” and the Ministry itself actually installed Wi-Fi system in schools. So far, the Judges avoided reaching a decision, and continue to tackle the Gov representatives with more and more questions, but in the coming months the moment will come in which the Court will have no choice but to take this hot potato in its hands and make a ruling whether the Government is harming the students’ health and what action it should take. Thank you for passing this information on. In the USA, parents are being ignored because having this technology relieves the teachers of some of their planning, organizing, and scheduling, responsibilities (even though we pay them to do this work) so teachers are gung-ho for it. Also, teachers/school authorities don't bother to do any research to find out the controversy that is currently going on about the harmful non-thermal adverse health effects that have been found from exposure to non-thermal radio frequency radiation from devices like WiFi. Parents are essentially in a fight with the uninformed teachers AND the uninformed US board of education, who are both under the erroneous assumption that since the RFR emissions from these devices meet the FCC thermal guidelines levels, that our children are also protected from the very serious adverse non-thermal health effects which have been found in the most current scientific research studies. Hard to believe that school authorities can't understand that the FCC guidelines only protect from thermal harm, especially since even the federal health agencies (FDA, EPA) have stated this as a fact. I have given schools credible documentation directly from the sources (FDA, EPA) showing them this fact along with sworn testimony from the most experienced and world recognized experts in the RFR field of study (Dr. Hardell, Dr. Phillips, Dr. Li, Dr. Lewisky etc.) attesting to the serious non-thermal adverse health effects that they believe are happening to our children with exposures to WiFi. Yet they have ignored everything!? Maybe if the courts side with parents in this particular case, it would help the USA parents to convince the ignorant. Thank you for your comment. Non-thermal effects were already established 40 years ago with thousands of research papers and EHS recognized even by the US government already in the 70's. This denial is political and money and army based. I do hope that we will win, we certainly have been doing our best. If we will, I do hope it will have global impact. This radiation is KILLING the children. Non-thermal effects exist. However, talk about "thousands of studies" showing them is untruthful and misleading. There are no thousands of studies... The total number of research studies done using cell phone radiation frequencies is below 1000. We do not know if research data obtained with frequencies that are not cell phone frequencies can be used directly to evaluate cell phone radiation health risk. There is enough evidence of non-thermal effects without using misleading claims of "thousands of studies". Dariusz, as usual you are incorrect and misleading. Have you looked at the bio-initiative lately? Only from the past 5 years they reviewed 1800 papers on EMF out of which about 1000 on RF/MW out of which 70% found adverse health effects (not to mention that most of the rest 30% were funded by the industry and are unworthy science and many times actually shows effects even though the conclusions says otherwise). They reviewed thousands from previous years as well. And as I already wrote in a few of our previous conversations, 1 study which proves effects is sufficient to establish adverse health effects. If a paper proved DNA damage, that is enough. But there are over 50 papers proving DNA damage. How many more do you need??? SO as usual you are incorrect, and misleading and it is my contention NO MORE SCIENCE ON THE TOPIC IS NEEDED...but of course scientists like you help create doubt as by saying "more research is needed" they ensure they have work. No more research is needed. AND THOUSANDS OF EXISTING PAPERS are sufficient. Unlike you who blocked me from responding on your FB page, I will not block you. But why won't you just conduct your misleading scientific agenda on your own blog? 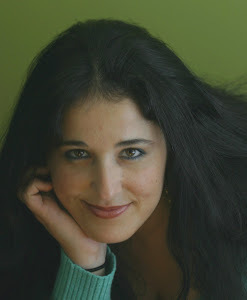 Thank you, Dafna, not only for your article but for your passion. I have mild epilepsy and the scourge of "smart" meters has begun in the small town of Springerville, AZ. I am giving 2 screenings of Take Back Your Power documentary on the 26th - I've extended invitations to the board of directors of the utility company. I am gearing up for possible disruptions at the screening and meeting. For that reason, I've been doing a lot of extra studying. Do you recommend a set of documents that I could look at? I already have the Freiburger Appeal, and I just copied a 64 page document called Evidence that Electromagnetic Radiation is Genotoxic (way over my head, but I understand the crux of it). I also am a blogger at smartisnotsmart.blogspot.com and you can e-mail me at smart.citizens@yahoo.com. If we band together, even across state lines, I believe we can accomplish much. YAH bless you for what you are doing. Thank you for your kind words and hard work! Be well! I was a 10 year veteran teacher, looking forward to many more years in my loved profession, when my school installed what they proudly called "high density wifi". I became deathly ill in just a few days. It's been 2 years since and I think of all the beautiful children that are in that school, not knowing that they are all being so highly radiated. I now live in my basement and am highly sensitive. I've felt entirely alone and defeated, but your voice has helped me to see that I can take action. Thank you, Dafna, for specifically targeting wifi in schools. You are an inspiration fro me to do what I can to raise awareness. Thank you for your kind words! I wish you health most of all and of course success with your efforts to raise awareness. I know it's not easy when you are unwell...but we have no choice.. Be well! After years of avid use of wireless technology, and disregard to adverse effects of uncontrolled RF/Microwave radiation, in July 2009 when I got a new MacBook I started suffering from severe EHS symptoms. My life has changed dramatically and now, the sole purpose of my life is to help people who suffer from EHS and to fight this criminal disregard for their existence, needs and rights.